Pro Dive Mexico PADI Career Development Center: The fastest track to a career in scuba diving: Our "Career Change Package Plus" package! 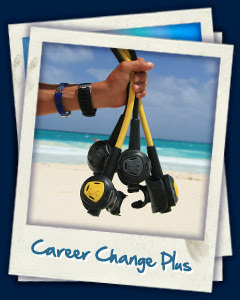 The fastest track to a career in scuba diving: Our "Career Change Package Plus" package! You are a certified Open Water diver and really fell in love with scuba diving? You are bored with your current job? You want to be able to earn money while scuba diving, all around the globe and in most exotic places? Even make a real career? Thats easy! It takes 72 days only, and even saves you a big buck, 1158 USD to be exact!! Yes, that is one thousand one hundred fiftyeight american dollars!